Fabada Asturiana Bean Stew Recipe | Simple. Tasty. Good. I tasted this fabada asturiana for the very first time in a tiny family restaurant in Barcelona and I loved it instantly. 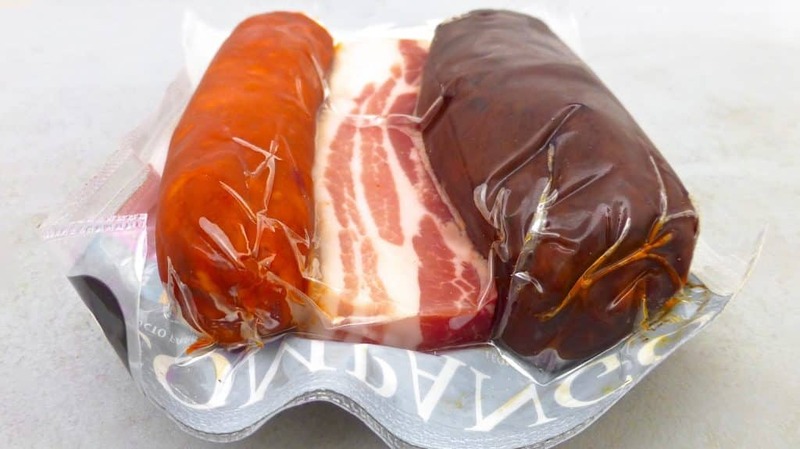 I had noticed these little vacuum bags in the supermarket containing a trio of smoked chorizo sausage, a thick slab of panceta and one blood sausage but never saw the connection. It is only after visiting the Canarian island of Tenerife that I stumbled upon these bags again. So I placed one of those bags in my shopping cart, added a box of dried white beans to that as well and took it all back home with me. All ready and set to start cooking my Spanish bean stew! Well, most of the dish just has to simmer and simmer away for a couple of hours. Dang, when I lifted that lid from the pan in the end… That smoky flavor does the trick here for me! 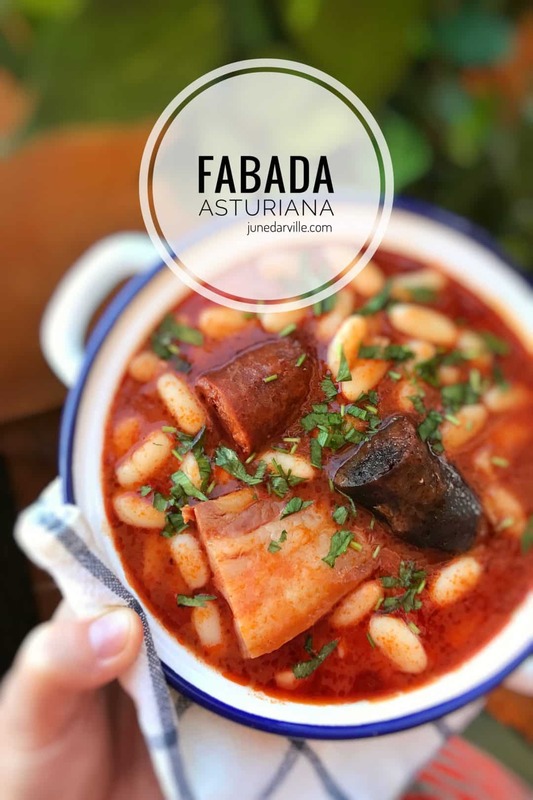 I made this fabada asturiana twice: once one the stove and a second time in my fabulous KitchenAid Cook Processor! 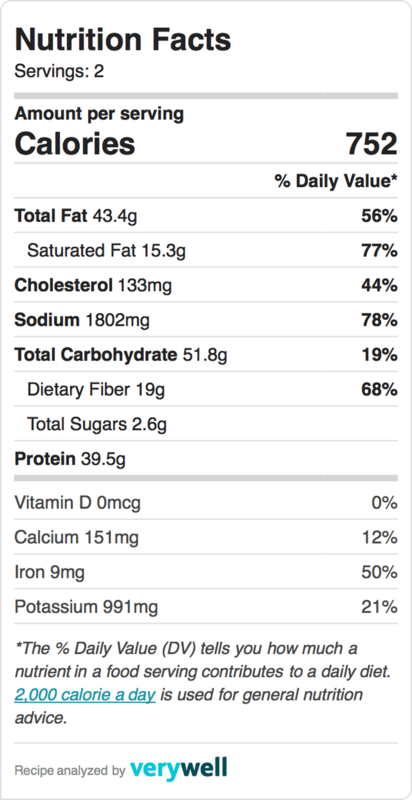 For the latter: just scroll down to the second recipe on this page. 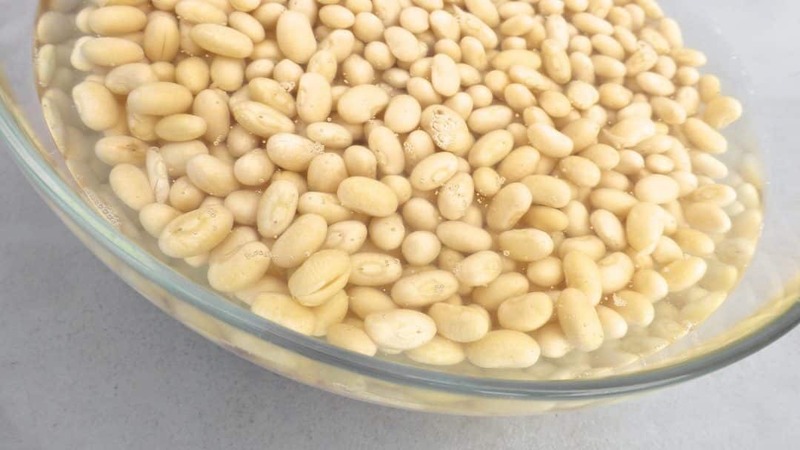 Rinse the soaked white beans. 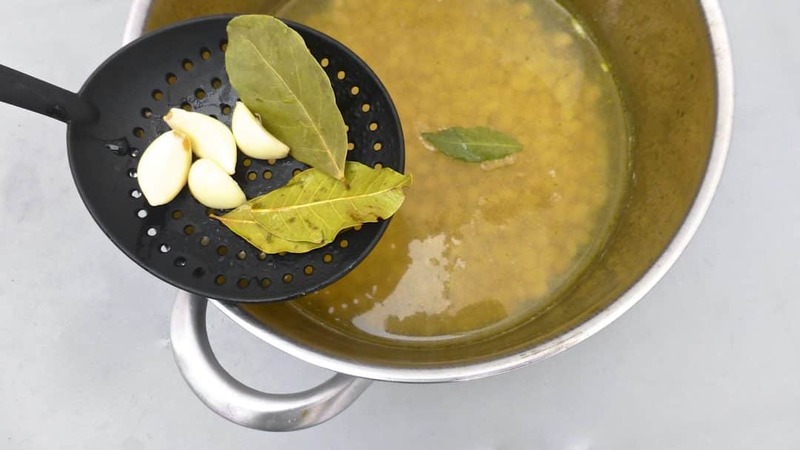 Pour the beef stock in a high and large pan and bring it to a rolling boil. Add the soaked beans together with the chopped garlic cloves, shallot, tomato paste, saffron (if using) and the bay leaves. Bring the beans to a rolling boil, then turn the heat low and simmer them for 30 minutes. After that add the chorizo sausage, the thick slice of panceta and the blood sausage. Bring all the ingredients to a rolling boil and then turn the heat low again. Simmer the stew for another hour until the beans start to fall apart. The chorizo will release red oil coming from the paprika powder which will color the soup red. 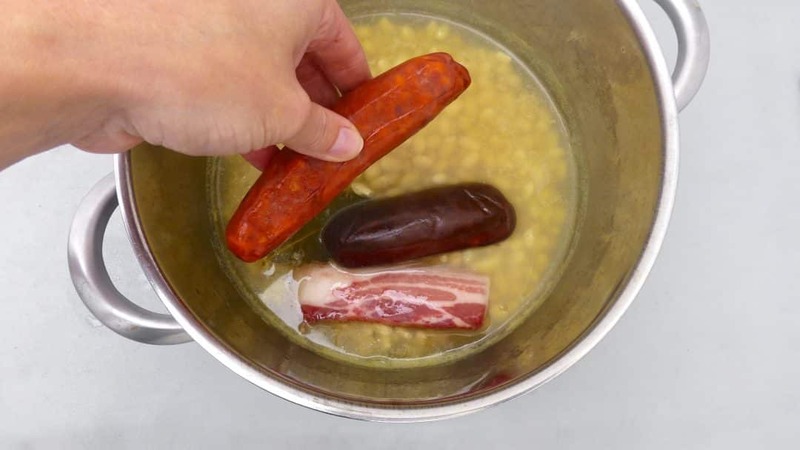 Once the beans are soft, take the pan off the heat and remove the cooked panceta, chorizo and blood sausage. Chop them in half. Check the seasoning of the stew and add extra pepper or salt to taste if necessary. Scoop the bean stew into bowls or deep plates, top with the cooked meat and serve piping hot. So I made this fabada asturiana bean stew twice: once one the stove and a second time in my fabulous KitchenAid Cook Processor! Here’s the second recipe! This fabada makes me think of a French classic called a cassoulet but that smokiness coming from the chorizo truly takes this Spanish stew to a totally different level… A family favorite! 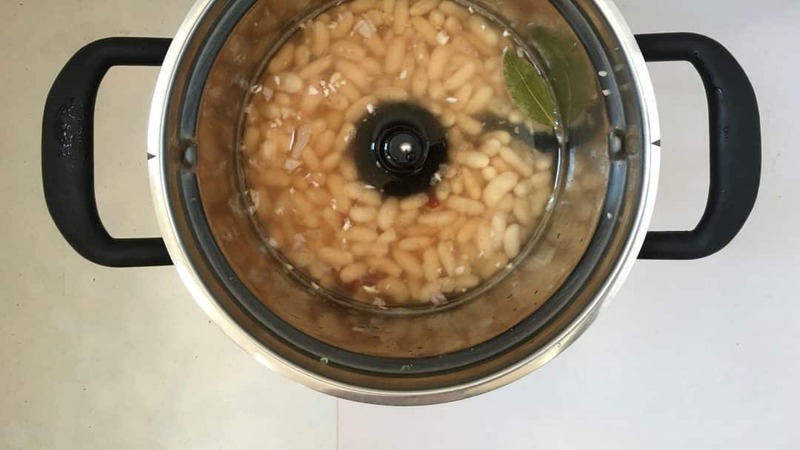 Another bean stew that is so heavenly you should definitely try it out: my homemade baked beans in the oven! 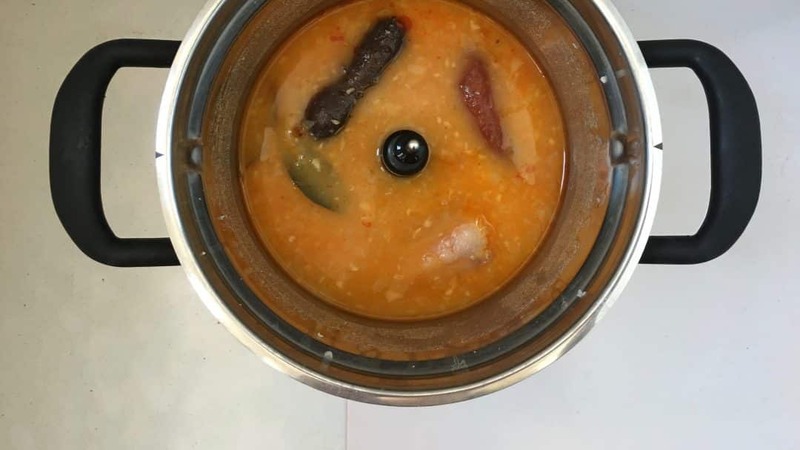 Spanish fabada asturiana, a great bean stew with smoked chorizo sausage, a thick slab of panceta and one blood sausage… made in my fabulous KitchenAid Cook Processor! 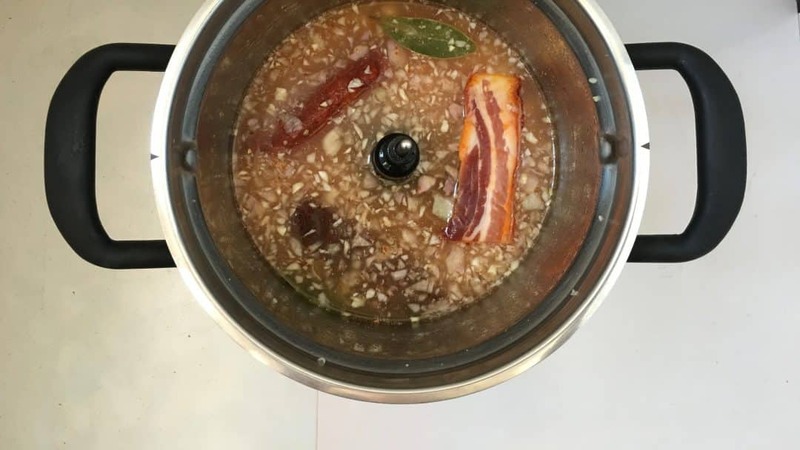 Spanish fabada asturiana, a great bean stew with smoked chorizo sausage, a thick slab of panceta and one blood sausage... made in my fabulous KitchenAid Cook Processor! Insert the MultiBlade into the bowl. Add the peeled shallot and garlic cloves. 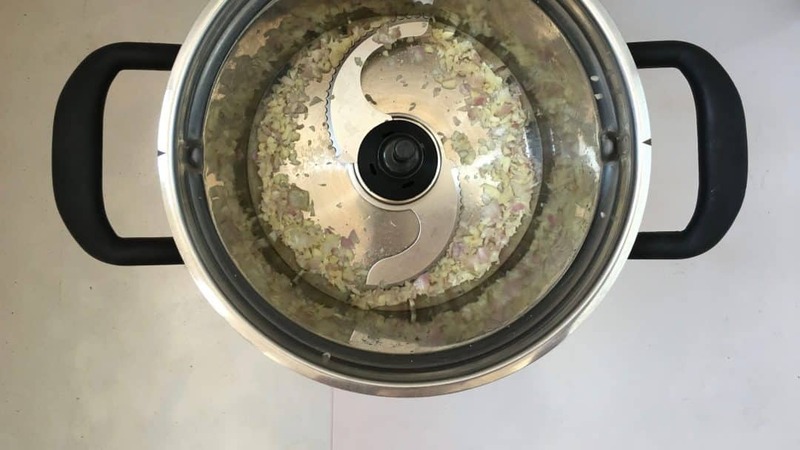 Close the lid and press Pulse for 10 seconds. Open the lid and scrape down the sides. Replace the MultiBlade with the StirAssist. 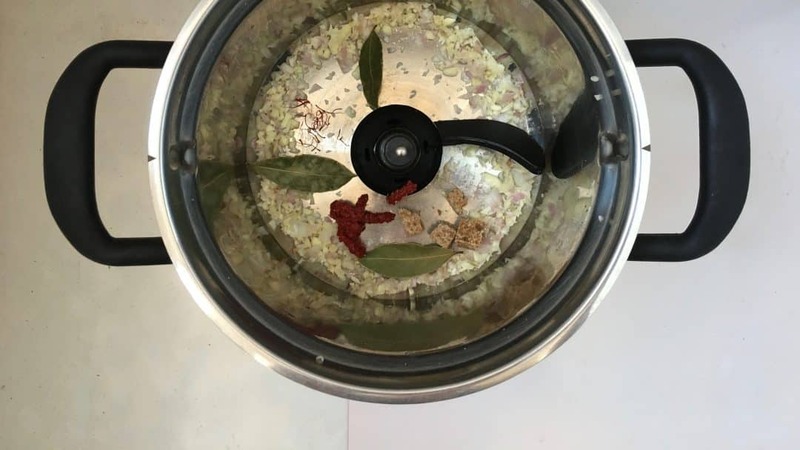 Add the bay leaves, tomato paste, crumbled beef bouillon cube and saffron (if using) to the bowl. Then pour in the soaked beans and the water. Season with a good dash of pepper. Close the lid and remove the measuring cup. Select STEW P6 and press Start. Step 1 shows on the display. Press Start to confirm. Once Step 1 is finished, add the 2 sausages and the panceta. Close the lid and adjust the time to 45 minutes (instead of 30 minutes). Press Start to activate Step 2. In the end press cancel to exit the keep warm mode. Check the seasoning of the stew and add extra pepper or salt to taste if necessary. Cut the sausages and panceta in half. 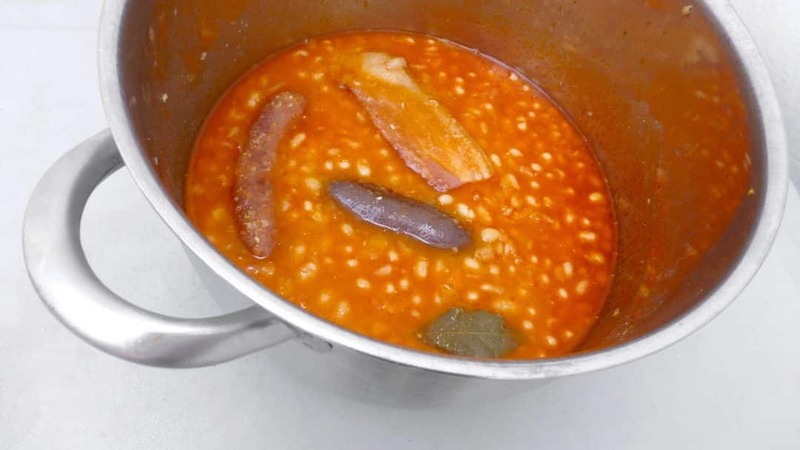 Scoop the cooked beans into large bowls or deep plates and top with the sausages and panceta. Seve piping hot. Thank you so much for the yummy recipe dear! Oh no blood sausage? It’s indeed easy to replace in this recipe. The main flavor here comes from the chorizo, which gives the stew a almighty smoky flavor. The best! We love bean stews so much, especially my husband! Anything with beans and pulses and the house is quiet 😉 for a moment at least LOL thanks for your kind comments! !